So now we have it: The Canal and River Trust inform us that ducks do not thrive on white bread and should not eat it; it is junk food for ducks and leaves them malnourished. Moreover, the bread which does not get eaten goes soggy and attracts rats and disease. We are also told that chips should not be fed to ducks. But this does not mean that children, or anyone wanting to feed ducks, have nothing to give them, because apparently they like eating lettuce, seeds, and defrosted peas. Their favourite food however is kale. They really love kale. In fact it was given "a duck approval" rating of 10/10 by the Trust's testers. I find this piece of information is a bit sad somehow. 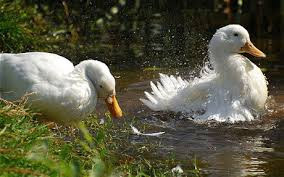 When my children and grandchildren were little nothing was more fun than finding a river full of ducks, and throwing them bread and sometimes left-over picnic food. And picnic food was certainly not kale, nor seeds, nor defrosted peas. So I suspect that many families who enjoy taking their children for such a good and innocent pleasure as feeding ducks with bread will feel a bit annoyed that they will have to buy kale or seeds or lettuce leaves to feed and nourish ducks, as instructed by the Canal and River Trust. but no cherubs, no bright light. a breath of sunshine tipping their wings. What a lovely poem for Easter. And totally agree about the ducks. It's a bit like the directive not to drink wine!